For me, fuel source was one of the most important factors. And, while availability, storage life, and heating power are importing things to consider, my main concern was selecting a universal fuel. Whether I am cooking, lighting, or heating, my preparations will be much more effective if I only have to store one type of fuel. I would also like a solution that I can use regularly in addition to working well in an emergency. Propane heaters are the most portable option. You can choose between wall-mounted and free-standing, blue flame and infrared, and vented versus unvented, but either way, they are a very safe and cost effective option for heat. Even the wall-mount units are only the size of a large suitcase and come with optional free-standing legs. They also put out up to four times the amount of heat of an electric heater. You can purchase units that heat 200 square feet (up to 9,000 BTU/HR) for $100 and units that heat 400 square feet (up to 18,000 BTU/HR) for $150. Advantages of propane are that it stores indefinitely, there is no smell, no refueling spillage possibilities, vast storage options, and there are many propane appliances other than heaters, such as torches, refrigerators, ovens, stoves, and electricity generators. One downside to propane is that it burns a little dirtier than natural gas and can leave a thin, oily film on windows and other surfaces. Liquid Propane (LP) gas contains more carbon than natural gas and burns nearly three times hotter. Natural gas costs more than propane generally, but it burns cleaner. Many people argue that natural gas is the most earth-friendly of the two gases because it is taken directly from the soil, while propane gas must be processed. All things considered, however, the cost and location will usually be the deciding factor when determining the right type of solution for heating your home. From my research though (I talked to a QuestStar gas service technician), natural gas doesn’t store well. Natural gas is a lighter-than-air gas that dissipates when released into the air. It does not burn as hot as other gases, but it costs much less. It must be hard-piped to an appliance from buried gas service lines. Natural gas heaters are very similar to propane, I only found one industrial modal that was portable. Since it’s a gas instead of a liquid, it must be pressurized and therefore is difficult to handle. Kerosene is a common and cost effective method for heating your home. Kerosene can be stored in large quantities for long periods of time. A gallon of kerosene will produce about the same heat output as a wheelbarrow full of wood. 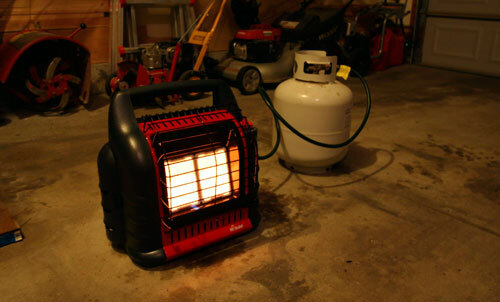 Kerosene heaters are very safe to use indoors, requiring very little ventilation. As with the other liquid fuels can also be used for lighting and cooking. Once broken in, kerosene heaters burn virtually odor-free. These heaters do require maintenance however as you have to replace the wick periodically and keep it trimmed. You also have to manually fill (pour) the fuel reservoir. Another thing to consider is that their output is over 22,000 BTUs and require a three-foot perimeter and thus aren’t good for heating small spaces (except for radiant heat models which produce half the output, but only heat directionally). They are also large and heavy. Most convection heaters have a fuel tank of about 2 gallons in capacity and will burn for 9 to 12 hours on one filling. The prices range from $125 to about $220, generally, and wicks cost from $10 to $20 each. Nearly every model you purchase today has an electric ignition that requires batteries, but they can be started manually with a match. Unless the electricity happens to still be on, electric really means diesel since you will have to run a generator. While electric heaters are one of the more safe indoor options and having electricity provides you with most of your other normal life comforts, generators are loud and can be smelly. From what I have read, portable indoor electric heaters only heat up to about 150 square feet as well, so you’d probably need two of them if you have a family. While I do not have a lot of experience with generators, it also seems like you will burn through a lot more fuel with this approach since a generator produces a certain amount of energy even if you are not using all of it, whereas a gas heater only draws from the tank what it burns. Electric heaters run about $40 and $80 dollars. Solar is one other option for generating electricity, but without a battery you’re going to be cold at night or during dark, foggy, winter days. While batter technology for home solar systems is coming, I did not include it since it is not readily available yet. As long as solar isn’t your primary energy source, I do think that they would be a great investment however. Most all of our gadgets and appliances run off of electricity. Solar is quiet, clean, and never runs out. Wood wins over every other option in terms of being a long-term solution. It is no-tech and can be used for cooking and lighting as well. It requires the most amount of work however and is the dirtiest. It produces smoke, dust, and embers and requires chopping, carrying, and manual ignition and it also sends up a signal indicating your location and that you have resources. It also runs the highest safety hazard. On the other hand, it is the only fuel source that you can replenish yourself. So, what’s the answer? First, I also realized that I wanted two solutions: one for short-term emergencies that provided more convenience and comfort and one for long-term emergencies that was sustainable. Wood is the answer for long-term and for that I am saving for a fireplace and a wood-burning cooking stove. That will be another project, expense, and post for another day. For short-term, I want something that is portable. I want to be able to move it back and forth easily between the garage and the shed. This rules out wood, kerosene, and natural gas. I wanted something that could heat the entire garage or family room but could also be pulled up close to you when working in a tight space (such as changing the oil on the car) and heating an entire room would be wasteful. I’m not concerned about being able to heat my entire home, that would be foolish during an emergency—up to 400 square feet is plenty. Kerosene is overkill for what I want and you can’t get as close to it as you would be able to an adjustable propane heater. All of the heaters work indoors. The vent-free propane units are the most safe, but they only come in the wall-mount models and require large external tanks. There are portable propane units that can run off of both large, external tanks and small, internal tanks. Infrared verses blue-flame? Infrared is directional and only heats things that are in front of it. Instead of heating the air, it heats objects. It is good for large, vaulted or drafty rooms, but since this type of room would be the last type of room you would want to be hunkering down in in an emergency, this decision is a no-brainer. You want something like a convection kerosene or blue-flame propane that heats the air and is omni-directional. And what about being a universal fuel? Kerosene is immediately ruled out as I don’t have a single other appliance that runs off of kerosene. Electricity is the most universal and while I currently have an electric dryer, oven, and stove, I much prefer cooking with gas and would like to replace these with gas options. I would be really pleased if I could find models that could run off of both natural gas and propane. This would allow me to use the indoor kitchen in an emergency if I wanted. Otherwise, I have a nice lantern and camp stove that run off of propane. After weighing all of these options, I decided on propane and purchased the BIG Buddy from Mr. Heater. It is small, light-weight, portable, runs off of either one or two internal tanks or one or two external tanks, cranks out up to 18,000 BTUs, has three heat settings, has a battery-powered blower to help circulate the air, has an built-in ignitor, and can heat the largest room in my house (up to 400 square feet). Here is a photograph of the unit in my garage running off of a single external tank. I have been very impressed with it thus far. There is no assembly required; it can be lit right out of the box. It is light weight and easy to carry. It was easy to light and the built-in, battery-powered blower significantly increases the units power. On high, I could feel the temperature rising in my garage within just a few minutes. I love how it can run off of either internal tanks, so that it is truly portable, or large external tanks for extended use. It has a built-in oxygen sensor and shuts off automatically if things become unsafe—very important if using indoors while sleeping. If you are interested in getting one yourself, Emergency Essentials is running a sale through the end of the month on the BIG Buddy and the adapter hose together for $155. Or, if you are willing to pay seven dollars more, you can get the unit and the hose from Amazon with free shipping for $162 and have it delivered to your door. I have two 20 lb tanks (the size on a barbecue grill). For normal living, this allows me to keep one in use and one on stand-by so that I don’t ever ruin a perfectly good steak running to the station to refuel. I will probably purchase one or two more that size (since you can carry them) and one 100 lb tank for the garage. The real solution though is a 500 or 1,000 pound tank that is installed on your property. I plan on getting one of these but am still researching the logistics and making plans. They are common in rural areas and other parts of the country. You can also have them installed underground so that it doesn’t take up space and so you don’t have to look at it. Most people lease tanks such as these instead of purchasing them. One of the nice benefits of leasing is that certified technicians check them regularly to ensure that they are operating correctly are responsible for any upkeep or repairs. The two companies that I am aware of that service the Wasatch Front are AmeriGas and Suburban Propane. Both of them lease but only AmeriGas sells tanks. I spoke with both on the phone and their prices are very comparable: ~$80/year lease for the 500 lb tank, ~$125/year lease for 1,000 lb tank, and ~$250 - $500 for installation, depending on it’s above or below ground. Prices to purchase from AmeriGas are $1,034 (500 lb above), $1,226 (500 lb underground), $1944 (1,000 lb above), and $2,100 (1,000 lb underground). If you’re interested, the first step is to contact your local government to check on applicable laws. Next, you need to consider how much space you have. Regardless of your city’s laws, the gas companies require the tanks to be 15″ to 25″ feet from your home (depending on the size of your tank). In addition, the Propane Education & Research Council’s residential website has a lot of helpful information, including a brochure about large tanks at home.